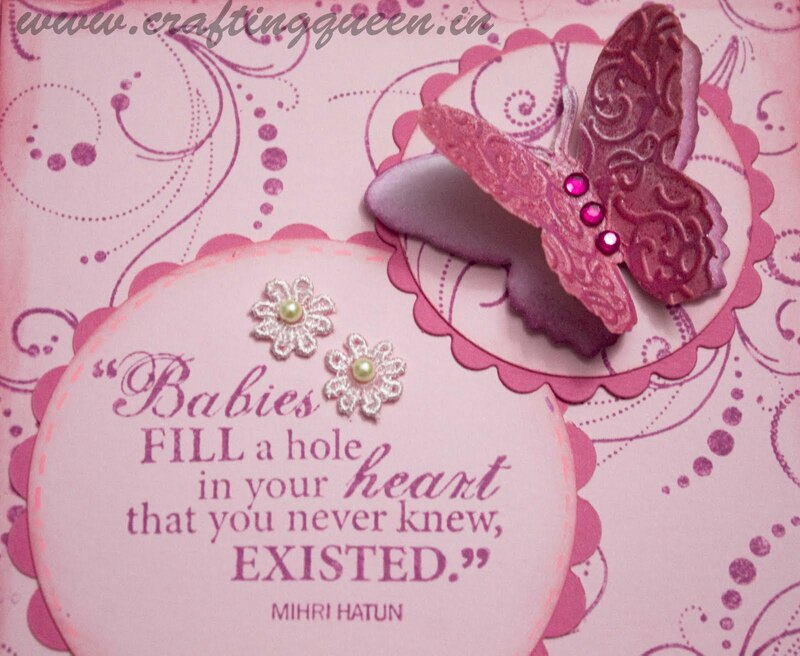 Crafting Queen: Its a Baby Girl! But a very close family friends had their first baby and it was all pink!! Yep a darling lil girl! Since we would go to see them real soon i made a all pink card for the couple keeping their tastes in mind :) I preferred to keep it simple and clean and didn't want to add anything very kiddish as well. So basically i used lotsa pink, distressing, some pretty flower ribbons, i used my CB die and embossing folder for the Butterfly. I distressed it with 'Worn Lipstick' and used a Fiskars pink glitter pen on embossed design and some rhinestones for additional bling.I also used the latest Fiskars scallop sentiment border punch and my 2 new stamp sets as well. Super happy! Supplies: Elle Erre Fabriano, Inkadinkado Flourish Stamps, Fiskars Precious Baby sentiments stamp set, Fiskars Circle cutter, Spellbinders Netabilities, Cuttlebug dies. cute... super duper cute... waiting for a status like this from you too... LOL.. :P... kidding... but super work...!! Karuna what a beauty. waiting to see more circle. Circles are my fav shape too and a circle cutter is on my wish list too. Saw one in itsy bitsy in Bangalore but they dont have replacement blades so I didnt buy. Is yours imported? Do tell me about your experience! absolutely fabulous Karuna!! Love the pink look! Tejal is going to be so happy to see an ALL PINK card with hints of white! Excellent job! LOVE this one. Lovely, Really love this one. Righto ET, I'm in love with this all pink and just pink card!!! love the flourishes, the circles, the beautiful scallops..and the sweetest sentiment! not to forget the butterfly!! super super cute!!! Thanks for such a sweet entry to ICR!! Wow adorable creation. Luv this. Luv the Sentiment too. WOW!! !This looks so pretty!! !I already love pink so much!!! 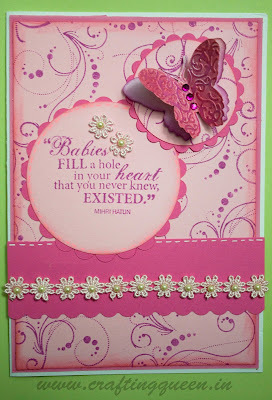 this is so pretty karuna, love the stamped flourishes and the sentiment is a wowzer too and not to forget the lovely embossed butterfly . owwwww this is sooooo pretty! Oh My God! This is gorgeous...I totallyy love the message on the card! So pretty in pink with such classy embellishments. Thanks for playing Mojo Monday!